To reserve a Grimes Park Shelter for FREE, please click here. This paper must be present during your party to ensure approval from the city to use. Click here for more information on how you can get involved to keep our parks and trails clean. Park Hours are from 5:30am - 10:00pm. All parks/trails/complexes are smoke, tobacco, and alcohol free. 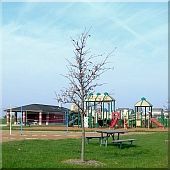 Beaverbrooke Park Park Includes: Shelter, grill, 2 picnic tables, and play-set. No electrical is provided. Grimes Community Complex The gym is a popular spot for sports teams to practice and for adults to play pick-up volleyball and basketball games. The Parks and Recreation Office is also located in this building. Citizens can rent the court as well as different reunions, meetings, and celebrations. 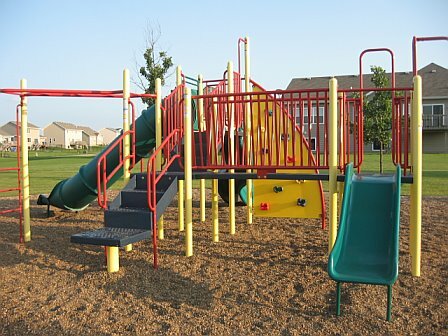 Grimes Community Complex Park Park Includes: New equipment swing-sets, play-set with mulitple slides and structures for ages 0-12, basketball hoops, sand volleyball court, green space to the west of the GCC, soccer goals, and picnic area. North Sports Complex Park Includes: 2 picnic tables, restrooms, and electrical. 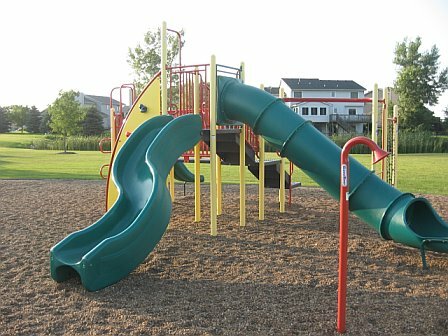 Its perfectly situated in between green space, sand volleyball courts, and the big play structure. North Pointe Park Park Includes: 3.48 acres park has a play structure, swing set, 16' square open shelter, and two picnic tables. Park Includes: two tennis courts; multiple soccer fields (9 acres) including one lit tournament field; three sand volleyball courts; three softball fields; four baseball fields; two basketball courts (4 hoops); a skate park; walking trails; restrooms; 2 concession stands, 487 parking spots, and a large play structure by the south concession stand. Kennybrook South Park Includes: 4.15 acre park will have a shelter, playground equipment, sand volleyball court, 1/2 basketball court, and greenspace for open play. 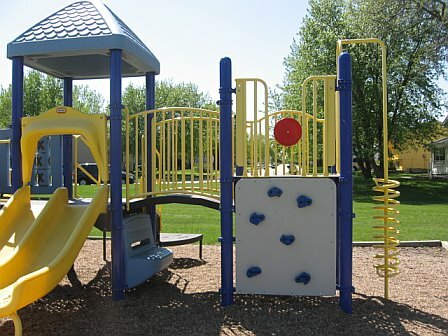 Lions Park Park Includes: 4.8 acre park has an open shelter, two grills, 4 picnic tables, 1/2 basketball court, two baseball/softball fields, soccer field, and playground equipment. Electrical outlets are provided. 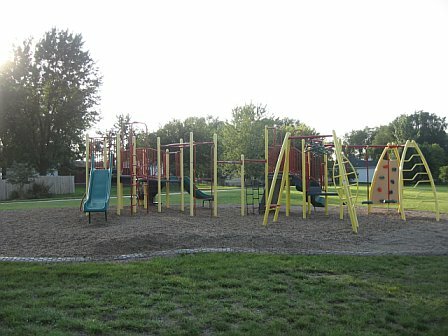 Shawver Park Park Includes: This 4.0 acre park is a neighborhood park located off of Shawver Drive. Access by walking trail. Has a shelter, 2 picnic tables, grill, and play structure. Plenty of green space for open play. Park Includes:Has two open shelters with electricity, two playgrounds, sand volleyball court, open green space, and three ball diamonds. 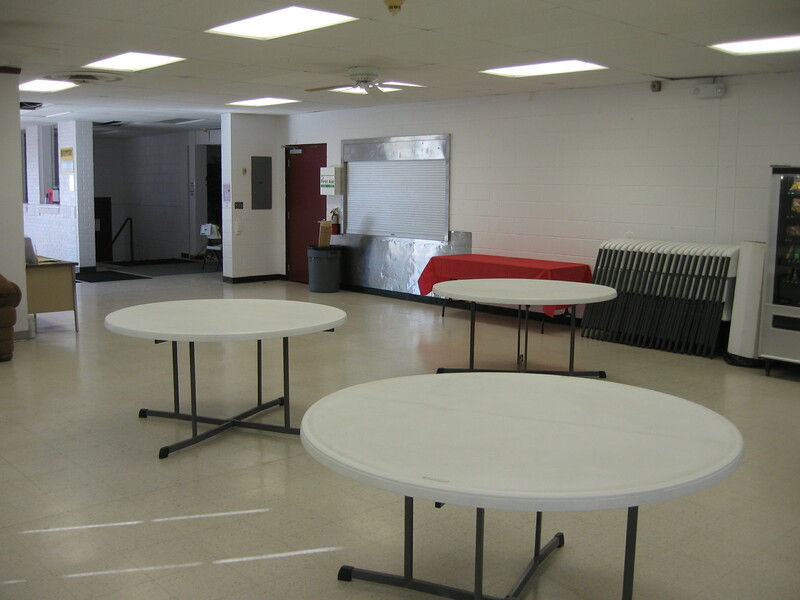 Four picnic tables are located at the west shelter and 7 picnic tables at the east shelter. Located at the South Sports Complex at the 4-way stop by South Prairie School. Parking is available. Located at the South Sports Complex on the south end just off of South James Street. Parking is available there and enter on the north side. Rules are posted to follow. 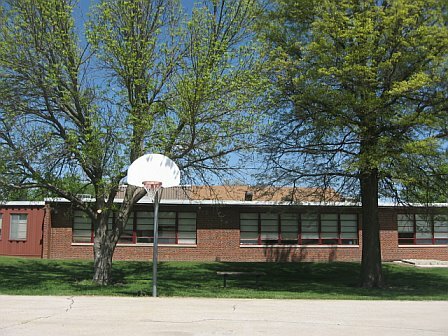 This 45-acre complex is located at 750 South James Street, just south of the South Prairie Elementary School. Constructed in 2002, it includes two tennis courts; multiple soccer fields (9 acres) including one lit tournament field; three sand volleyball courts; three softball fields; four baseball fields; two basketball courts (4 hoops); a skate park; walking trails; restrooms; 2 concession stands, 487 parking spots, and a large play structure by the south concession stand. *If you would like to rent the fields outside of the local clubs seasons using our fields, please email Brett at bbarber@grimesiowa.gov at the Parks and Rec Office. 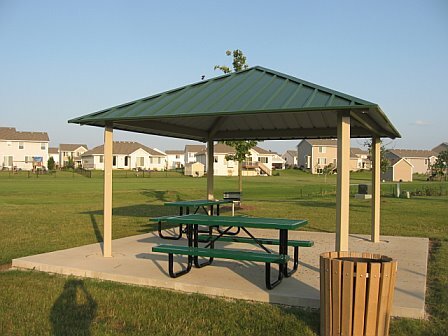 This shelter is located by the south concession stand and contains 2 picnic tables, restrooms, and electrical. It's perfectly situated in between green space, sand volleyball courts, and the big play structure This shelter is also booked during soccer club season and baseball club season (mid-March to mid-June). -Located on the south side of the Grimes Sports Complex off of South James Street. Parking and the closest entrance is on the southeast side of the complex. Phase I construction (base option plus add-on options) will begin Spring 2011. The completed project includes three phases that adds up to $2.3 million. Phase I ($850,000) is funded by the City Park TIF that is allocated each year to the parks. Phase I should be completed by Fall 2012 and will provide irrigated softball fields (without fencing) and greenspace for soccer. Phase II and Phase III start dates have not been determined. This complex is located off of North James Street behind the North Ridge Elementary School in Grimes. This 26-acre sports complex will have 5 little league softball fields, 1 adult softball field, over 5 acres of greenspace for soccer, 2 tennis courts, basketball courts, a concession stand, and 238 parking spots. 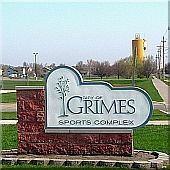 The City of Grimes opened this Community Center in June 2006. It's located just off of Hwy 44, south on Main Street where the old DCG Middle School existed. The gym is a popular spot for sports teams to practice and for adults to play pick-up volleyball and basketball games. The Parks and Recreation Office is also located in this building. 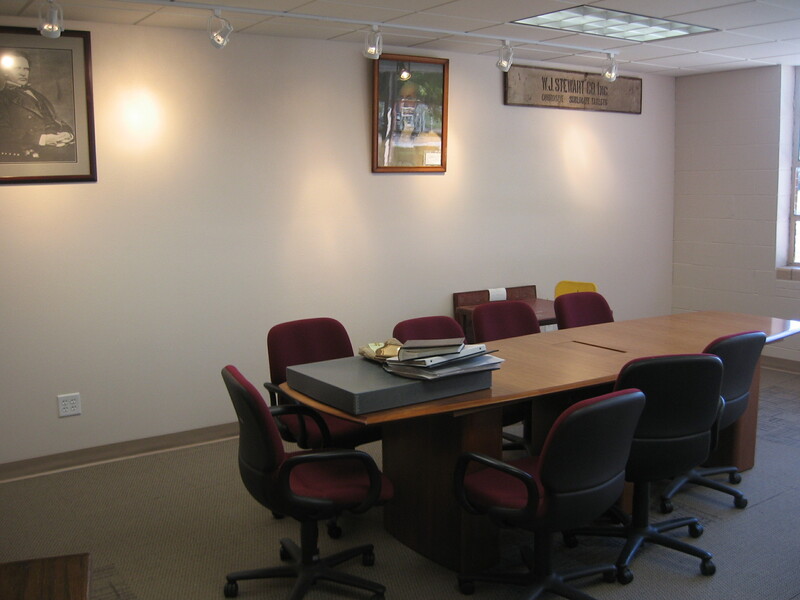 Citizens can rent the court as well as different rooms of the facility for parties, reunions, meetings, celebrations, etc. Located at 410 SE Main Street just south of the GCC. 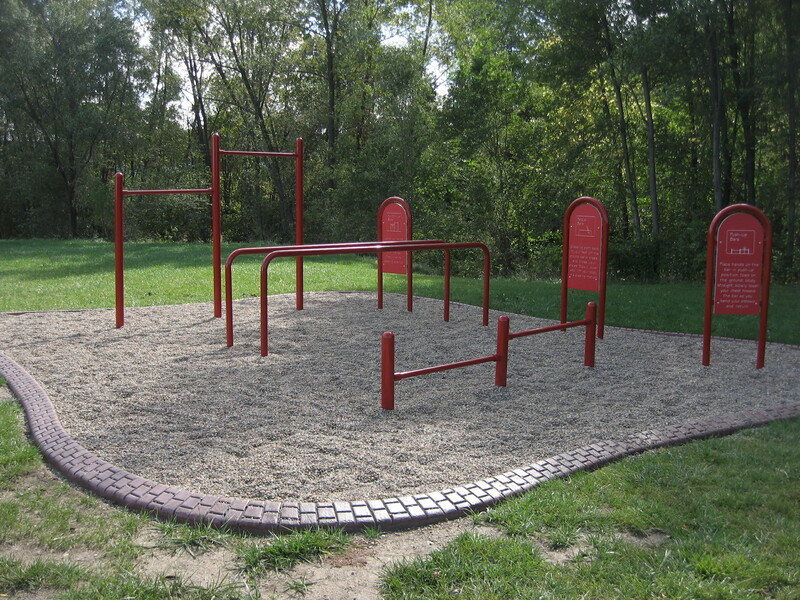 NEW as of June 2011- New equipment includes a swingset, playset with multiple slides and structures for Ages 0-12, basketball hoops, sand volleyball court, greenspace to the west of the GCC, soccer goals, and picnic area. - Developed in July 2016, this .5 acre park has playground equipment, swings, a half basketball court, trails, and benches. It's located along NW Brookside Drive in the Autumn Park Development on the west edge of town just northwest of the Grimes United Methodist Church. Developed in November of 2007, this 6.4 acre neighborhood park is located at the south end of Park Circle off of James Street. Access by the North Walking Trail. Includes shelter, grill, 2 picnic tables, and playset. No electrical is provided. This 4.8 acre park has an open shelter, two grills, 4 picnic tables, 1/2 basketball court, two baseball/softball fields, soccer field, and playground equipment. Electrical outlets are provided. 1) Off Hwy 141, exit onto Hwy 44 West. 2) Going West on Hwy 44 coming into Grimes, turn north on Harvey Street. 3) Turn right (west) on 5th Street and go to the end and the parking lot is there. 1) Going east on Hwy 44 coming into Grimes, turn north on Harvey Street. This 4.0 acre park is a neighborhood park located off of Shawver Drive. Access by walking trail. Has a shelter, 2 picnic tables, grill, and playstructure. Plenty of green space for open play. One of Grimes' first parks, this 8.5 acre park is located at 200 North 1st Street, north of Highway 44 by the Grimes Library. Has two open shelters with electricity, two playgrounds, sand volleyball court, open green space, and three ball diamonds. Four picnic tables are located at the west shelter and 7 picnic tables at the east shelter. 3) Waterworks park is immediately to your left (west). 2) Waterworks park is immediately to your left (west). Developed in October of 2009, this 3.48 acre park has a play structure, swing set, 16' square open shelter, and two picnic tables. The park is located on the northeast side of Grimes just east of Hwy 141. Just take Highway 141 north to NW 78th Avenue. Developed in September 2009 with full grade and shelter, and then Phase 2 in 2013 included park equipment and trail, this 3.6 acre park has a 20' wide open gazebo with 2 picnic tables (no electrical or grill). It's located in the heart of Glenstone Trail off of SE 37th St. in the SE portion of Grimes along the Johnston Border. Kennybrook South Park (750 SW Brookside Drive)- Constructed in June 2018 just off of SW Brookside Drive in the western part of Grimes. 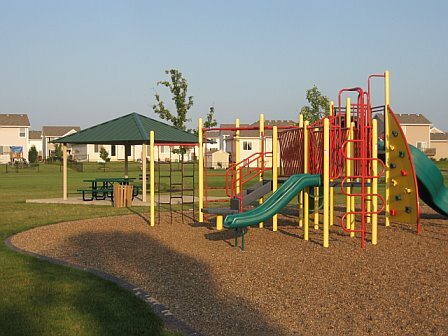 This 4.5 acre park includes 1/2 basketball court, playground equipment, shelter, trails, greenspace, and sand volleyball court.